The Bon Secours Retreat and Conference Center is a ministry of the Sisters of Bon Secours. 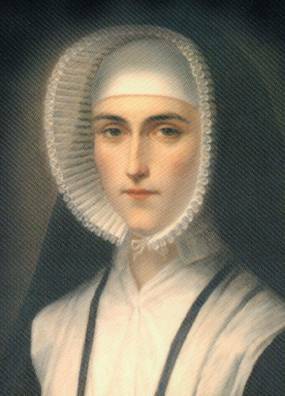 Since their religious order officially formed in 1824, the Sisters have provided “good help” to those in need, and compassionate care and concern for all people. We strive to fulfill this mission through our hospitality, facilty and spiritual gifts that presenters bring to our guests. Paris, 1824 – Amidst the devastation following the French Revolution a group of 12 women rose up to nurse the sick and dying under the banner of God. Revolutionary themselves, they were some of the first to leave behind the security of the cloister and live in radical solidarity with the poor. In 1881, the congregation was invited to the Archdiocese of Baltimore and crossed the Atlantic to establish a health care ministry in Baltimore, Maryland. In just 20 years the congregation grew so great that convents were established in both DC and Detroit. The Sisters were the first in the world to provide formal health care and the first in Baltimore to offer day care. It was here that working mothers, with orphanages as their only alternative, were able to leave their children as they worked the back-breaking shifts necessary to support their lives. The Sisters have a long tradition of willingness to take risks in pursuit of innovation, growth, and extension of mission – one such example arose in their desire to create St. Edmond’s Home for Crippled Children, the very first Catholic homes for the physically challenged. They established their first hospital in Baltimore in 1919 and opened their second in Michigan in 1945. By 1980 the Sisters had established several Catholic hospitals, long-term care facilities and a myriad of other health care services. The Bon Secours Health System was formed in 1983 to provide skilled, unified management and professional resources for all Bon Secours health care operations while preserving Jesus’ healing mission and Bon Secours’ tradition of providing quality care to all men and women, especially the poor, sick, and dying. In 1962, property was purchased in Marriottsville to build a cross-shaped Provincial House, Sisters’ infirmary known as Marian Hall, and Novitiate to nurture an increase in vocation inquiries and support the growing needs of the Congregation of Bon Secours in the United States. The new home provided combined facilities for the religious community and accommodations for lay guests. By 1969 the sister’s outreach services were known as the Marriottsville Spiritual Center offering religious and on-going educational programs including retreats, conferences, spiritual renewal workshops health-related programs, space as a meeting facility, and other similar projects. 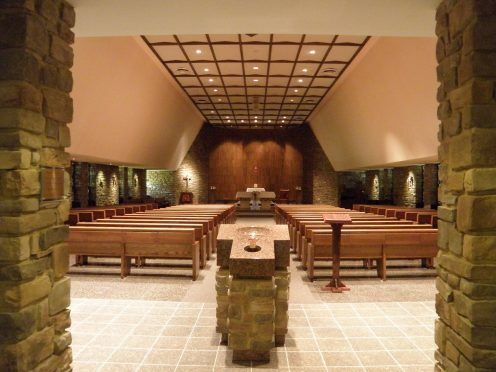 Visitors and retreatants seeking Christian maturity have the opportunity to participate in Mass with the sisters in the Chapel wing seating up to 250 and witness the spirit of joy prevalent among the sisters, their helpfulness in discussion periods and their spirit of prayer. The bookstore offers on-going education resources encouraging an awakening in, or nurturing insights to, an awareness of a relationship with God. Use of the retreat center is rewarding. The effect of the sister’s ministry incalculable for healing relationships and the inner growth of the Spirit are intangibles that cannot be measured. From the beginning, the building had all the physical properties needed for such use. The grounds naturally lend itself to ecumenical use while encouraging the values of the Roman Catholic faith in this beautiful and holy place. The serenity of these 313 acres of woodland and farmland rests at the high point of a hilly setting in the Howard County countryside some 20 miles from Baltimore City. Ensuring good stewardship of the resources entrusted to our use, the wooded landscape includes a water storage pond, needed for fire protection, but integrated with the site and enhanced by a Japanese bridge to provide a setting and facility for meditation and retreat. The spacious grounds are a haven for native wildlife and available to sponsor recreational projects and picnics. The labyrinth and peace garden facilitate more reflective activities. The spiritual center’s ministry is an integral part of the Bon Secours healing ministry. In 1981 the name was changed from Marriottsville Spiritual Center to Bon Secours Spiritual Center to reflect the center’s mission to bring the “good help” and the good news of God’s love to all it serves. In 2012 the outreach was expanded and the center took the name Retreat & Conference Center at Bon Secours. We offer programs and physical space in nature to encourage open communication, compassion, respect and trust among community. We embrace our objective of serving the needs of religious and laity alike within our sacred space and through our ministry of warm hospitality. The words of Bishop T. Austin Murphy at the 1965 dedication of our property, “Behold the dwelling place of God and men,” aptly describes the atmosphere that characterizes the Retreat & Conference Center at Bon Secours today. We welcome all to our special healing space! If you would like to donate to the Bon Secours Retreat and Conference Center, a ministry of the Sisters of Bon Secours, please click here. This interactive timeline of our Center’s history was created for our 50th anniversary in 2018. We are proud of the 50 years of growth that has taken place at our spiritual oasis in Marriottsville, Maryland. The Sisters of Bon Secours were innovative in their design and dreams for the Center’s use. The conference ministry has grown from a few groups holding yearly meetings to a full calendar of reservations by non-profit groups, businesses, churches and families. The retreat ministry, which started with Friends Day of Prayer retreats once per month, has grown to an average of 10 retreats per month! Retreats now include diverse topics and presenters that cater to an interfaith audience. We invite you to take a little trip down memory lane and view the timeline below. You may browse by using the arrows to the left and right or you can jump ahead by selecting a date directly on the timeline. Enjoy!